Morning all. The new challenge over at Cardz4guyz is 'Whatever the Weather'. Now I must have had a card in mind when I chose that topic but, as I couldn't remember choosing it, I have no idea what it was. Starting from scratch it is then! There are so many obvious choices to make with rain or snow but I wanted to do something else. Sun was less obvious to me and needed more thinking about so I decided that was it. I dug out a brilliant image from Mo's Digital Pencil. 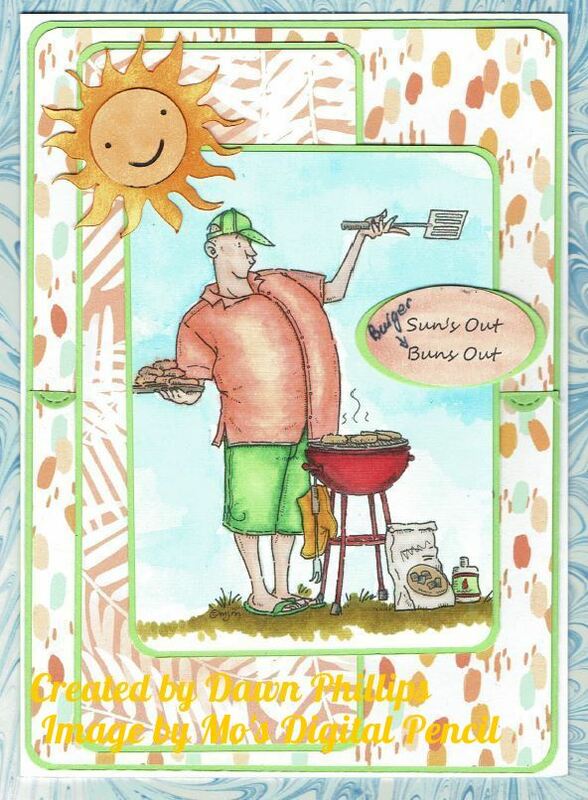 Big Guy Grilling is a fabulous image to colour and I don't colour it often enough. I chose some backing papers from a pad Will bought me for Christmas. I'm really mean when using these papers as I only usually buy cheap pads. This one was a First Edition Paper pad called Paradise Crush and I know he was daft enough to pay for it - bless him. I coloured my image using spectrum noirs and created the sentiment on the computer. I finally cut my smiley sun out on my cricut to finish it off. Now you had better expect some of that rain I was talking about. I live in England and you can't have a BBQ without the weather letting you down, can you? 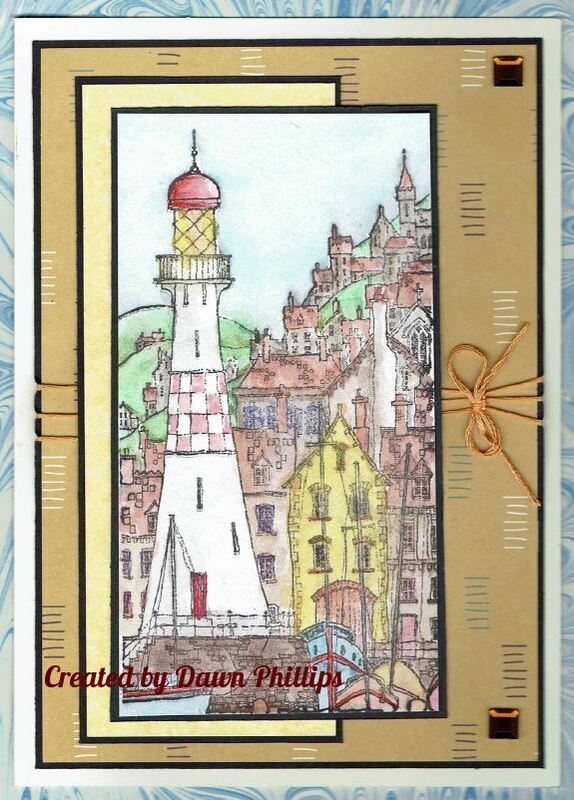 Please pop over and join in the fun or I won't have any projects to pick a winner from. Besides, the DT ladies have created some awesome inspiration. Morning all. Time for a new challenge at Back to Basics and Beyond. This week we want you all to use a spray somewhere on your project. I will admit to being a little bit daunted by this as it's not something I do. In fact, the only spray I have is a solution for H2o's that is supposed to be better than using water. To be fair, it hadn't seen the light of day for years. Anyway, I debated whether to watercolour a background but couldn't decide on anything. In the end I used some spiced marmalade and squeezed lemon distress inks to sponge a background and then spritzed it with my spray. Once it had dried I was surprised to find how nice it looked. It gave a little texture to my flat ink. 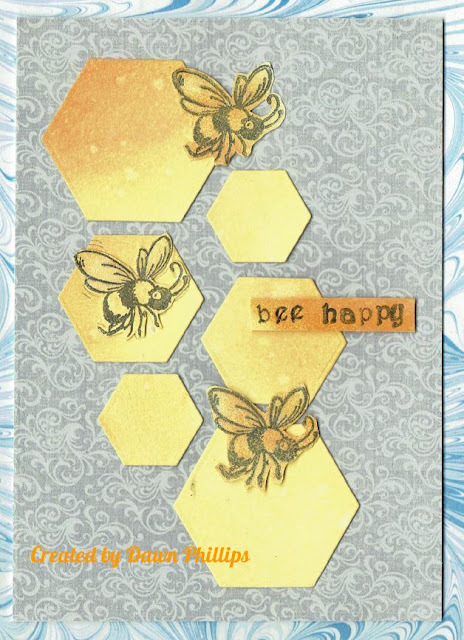 To make my card I cut the inked paper into little hexagons and stamped a bee stamp on what was left. I have no idea who's the stamp is as it came to me in a bag of stuff from a friend. I've stuck the lot together on a card that I had covered with a scrap of grey backing paper and stamped my sentiment on another scrap of inked card. I did add a little spectrum noir glitter pen to the wings. It's just a pity you can't see it sparkle. It's one of those cards that I keep looking at. It's growing on me. Please pop over and join the fun. We have suffered a little with entries recently due to the changes with the link tool. It should have been sorted this time. Besides, I need to see your inspiration so I can convince myself to invest in some different sprays. Morning all, me again. 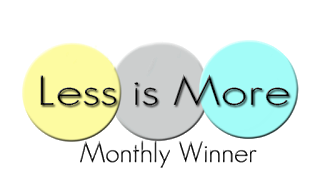 As well as the new Make My Monday challenge, today starts a new challenge over at Sparkles Monthly Challenge. Cathy has chosen either Flowers or Religious Cards. 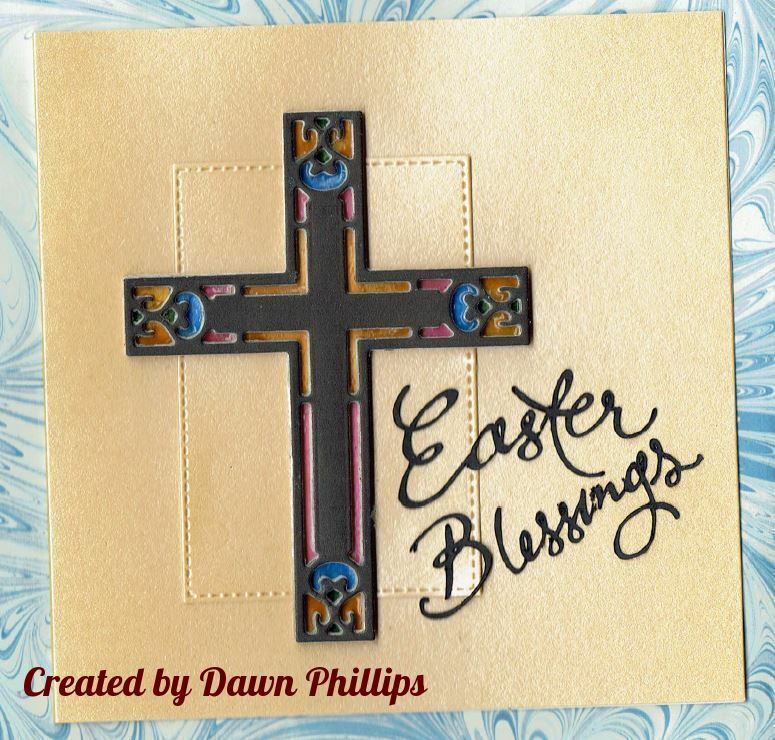 Although it is Easter this week you could chose any Religious Festival and any Religion. Today is the start of Holy Week in the Christian calender and I will be busy with services this week so it seemed appropriate to make an Easter card. I have a beautiful cross image (I think it's a Marianne Designs die) that would give me the opportunity to try a technique I'd seen recently on Youtube. Jennifer Dove's stained glass technique shows a couple of ways to create faux stained glass with your dies. To be fair, although I am happy with my results here, it would work better with a more open die. I did layer several dies on top of each other to get dimension but, as I hadn't any crystal glaze, I did cover the bottom layer with clear embossing powder. I also cut the top layer in black rather than embossing it with silver. I was so pleased with the results I just stuck it to a coloured card blank and added the sentiment. It's so vibrant in real life. I will definitely try this technique again. 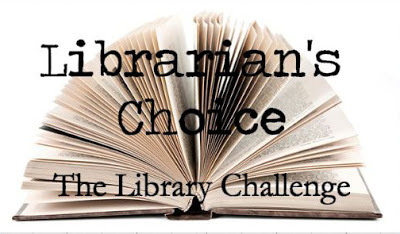 Please pop over to the challenge and join in the fun. We do love to see your designs. Morning all. I was so pleased with the entries for my 'humorous' challenge over at Make My Monday. It was so much fun to see how everyone interpreted my challenge. 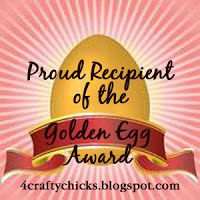 If you would like to see who I have chosen as winners please pop over and have a look. Whilst you are there you can check out the new challenge. Sue has chosen 'Diamonds' as the theme for this fortnight. 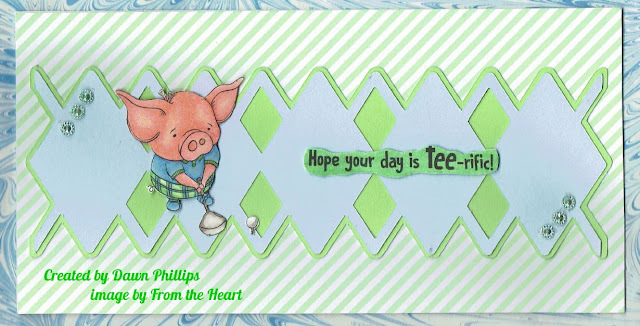 I have to admit that I was unsure where to go with this so I popped Diamonds into my Cricut Design Space and found a border that reminded me so much of the Pringle design that Golfers wear a lot. Well, once I'd seen it I couldn't get it out of my head. I printed a little Pigwit Golfer that I've had for ages. Unfortunately, Faith, the artist, passed away a couple of years ago so it is no longer available. I have a bunch of her images and they always make me smile. She was such a talented and generous person. I do miss her images. Anyway, I coloured him in the same colours that I'd chosen for the border and mounted the lot on a DL card that I had covered with stripey backing paper. What do you think. I'm quite pleased with the result. I might try some other border designs. They are very effective if you blow them up a bit and used them as a central feature. Please pop over and check out the DT cards. The ladies are hugely talented and I am sure you will be inspired. I'm just a bit excited to be posting this morning as the new subject over at The Alphabet Challenge is mine. I get to pick the winners so let's see what you can do with the topic of 'Buildings'. I will admit that when the theme popped into my head I had no clue what I would create so it is still a challenge for me. I had a good old rummage around in my stamps thinking that I must have something to fit the bill and found an old coastal town that may have been Papermania. It certainly was from one of the Do Crafts lines. I bought a couple of these stamps years ago and became a bit overwhelmed by the amount of colouring. I remember using it for the spotlight technique once leaving most of it uncoloured and just doing the lighthouse. I was still a bit unsure but decided to get the watercolours out. It could have gone either way at this point as I am no artist. Even when I was doing it I couldn't leave it alone and kept adding more colour and then taking it off. I really didn't like it. Anyway, about teatime, I gave up and went off to the kitchen. I nipped back the following morning and I found it had dried really well. I'm a big fan of walking away and checking later. Even with Alcohol inks I find I often like it better once it's dried. Anyway, here it is. What do you think? I just layered it onto some similarly coloured backing paper and added some thread and a couple of gems. I may try some more water colouring now I've got my eye in. Please pop over and play. It would be nice to have some cards to judge. Morning all. 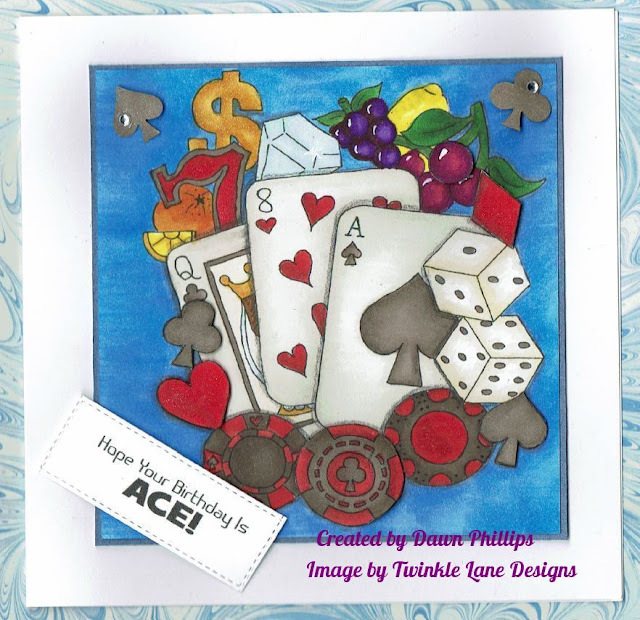 It's time for some fun and games over at Cardz4guyz - quite literally! Sian has chosen that very subject to inspire you. You can chose any sport or game. Now, traditionally, that means me getting my cricket stamps out but I decided to challenge myself a little. I'm not a gambler myself (err, does the odd game of bingo count)? 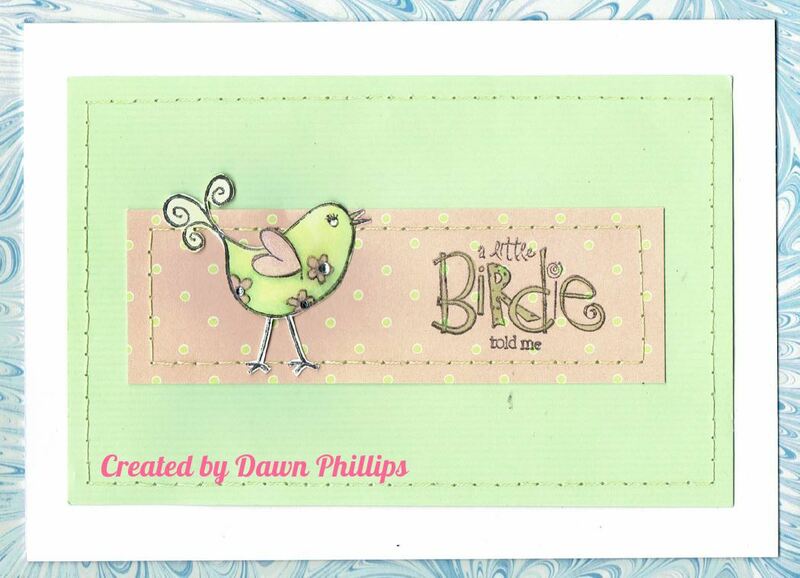 I did quite like this little digi from Twinkle Lane Designs though. I thought it would be handy for male cards. Then I tried to colour it! I have to say that I was very tempted to bin it within the first ten minutes. However, good old Alyce at Kit an Clowder is a great advocate of the 'keep going' school of colouring. I very often find that walking away and coming back to it later makes such a difference to how I like an image. When I went to bed last night I hated it. It was flat and lifeless. First thing this morning I came back to it and added some shading and decoupaged some bits. I even added a bit of shimmer to some elements. Then I coloured the background and stippled some ink over the blue. I can't believe how much I like this whole thing now. It's a pity the picture doesn't show up the shimmer. It's so much nicer with a bit of sparkle. What do you think? Did perseverance pay off? Why not pop over to the blog and join in the fun. You can see the other DT cards too. They are fab, I promise. New challenge time at Back to Basics and Beyond. I have to admit I don't think I've ever made a One, Two, Three Card before. The idea is that you use one of something, two of something else and three of another. In this case we are asking for One Topper, Two Colours and Three Gems, pearls or jewels. The colour combination was fairly easy as I love green and pink together and has some suitable scraps to use up. One topper was a little more tricky. In the end I chose a stamp that I'd had from a magazine back in the ice age. As it happened, the bird had three little flowers on so I put my gems in the centre of each. You will have to look carefully as they are tiny. What do you think? I'm quite pleased with how it turned out. Please nip over and give it a try. It's a really fun challenge and the DT ladies are really talented. I am a working mum with a love of papercrafts. I also enjoy reading and I coach cricket for the under 10s at my local club. I've tried scrapbooking and card making and I also create atcs. My long suffering husband and son are very supportive of my crafting obsession (especially since I've move all my 'junk' to a new craft room and given them the dining room back!!! Sorry Mamma, it had to be done.